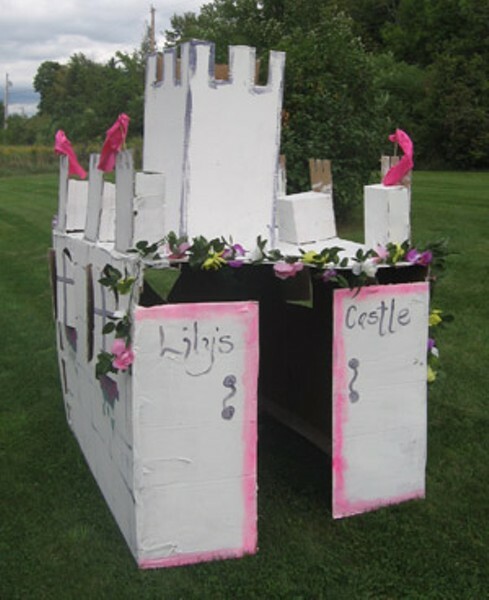 Cardboard Castles | The Party Planner | Kids VT - small people, big ideas! For your next party, think outside the box — literally. Build a cardboard playhouse with your kids and organize the party around it. It's creative, inexpensive and gets them involved in the process.First, brainstorm a theme. Anything requiring a building or structure will work. Some suggestions: castles for a royally good time, the Emerald City for Oz-some fun or a barn for horsing around. Supplies: You'll need large cardboard boxes, a utility knife, two to three rolls of packing tape on a dispenser, and paint or decorations. Get some boxes — big ones. It's easier to cut down large boxes than it is to tape pieces together. Home improvement and furniture stores are great places to get free boxes. Thanks to Alice at Town & Country Furniture Shop, for suppling the boxes for my 6-year-old's princess party! Sketch the design on paper. Plan a playhouse, a backdrop or even a photo-board with holes for kids' faces. Start cutting and taping. It took about a week for us to put together the castle for my daughter's party. We used our garage as a work area, since the castle was quite large. Once you have the structure assembled, reinforce corners, doors and windows with extra tape. Bust out the decorations. My two daughters painted the castle white while I painted the window boxes and special accents. Then we went through the dress-up bin for other accoutrements. With a few silk flowers and a sash, our princess castle was complete. Play! Our playhouse lasted for about three weeks. The kids loved it, and the total cost was under $50.